As I'm sure you guessed, I've been MIA for the last week because our baby boy finally arrived. 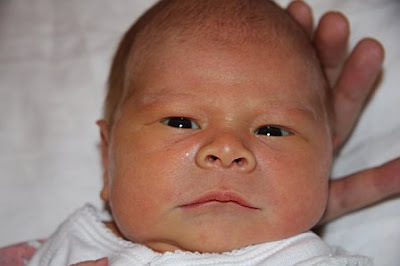 "Gorgeous George" was born on September 27th at 4:35am weighing 7lbs 12ozs. It was love at first sight and we're soaking up every moment with him. My blog posts will be few and far between for a little while but keep checking back. 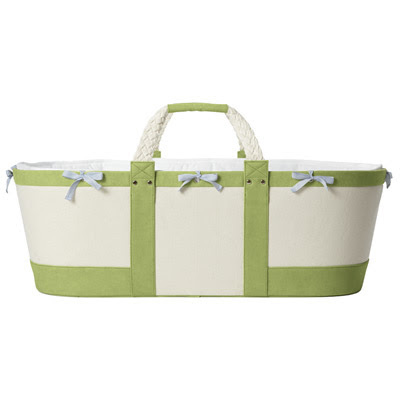 My sister-in-law told me about this adorable moses basket from Serena & Lily. The Sausalito Basket is a cute variation from the traditional weaved basket style moses basket and comes in green, pink or chocolate. 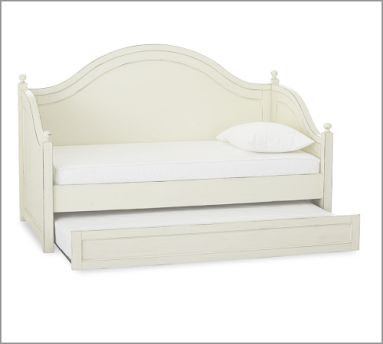 You can even monogram it with an initial. Adorable! The Environmental Working Group recently came out with the findings from a 10-month study of over 1200 cell phones. Their research shows that cell phones do emit radiation and prolonged use significantly increases the risk of brain tumors and other health problems. 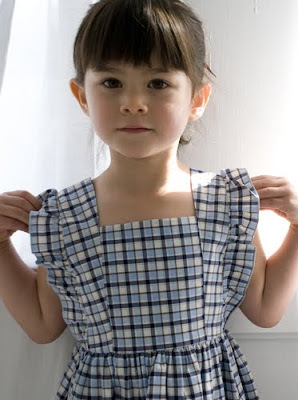 They emphasize that children are especially at risk. This is a scary reality for those of us who are connected to our cell phone on a daily basis whether it be for business or to stay in touch with friends and family. Frightening, but not too surprising I suppose. See the email newsletter below and click the links to read more - like how your cell phone measures up and could increase your radiation exposure by a factor of eight! Have you ever wondered if the cell phones that we all depend on emit radiation and are safe to use?At EWG, we did wonder and undertook a 10-month research review to understand the risks -- and our research is receiving a lot of attention. Turns out, cell phones do emit radiation -- enough so that scientists are concerned about potential cancer risks. We'd like to believe that cell phone radiation is safe, but no one can say for sure. Much more research is crucial for scientists to reach a conclusion.Make no mistake -- at EWG, we are still using our cell phones. But we believe that until scientists know much more about cell phone radiation, it's smart for consumers to buy phones with lower radiation emissions. As a result, we have put together the most comprehensive online consumer guide to cell phone radiation, rating more than 1,000 cell phones marketed in the U.S. Response to our guide has been overwhelming. EWG has been featured in news articles -- from The New York Times to USA Today -- on TV -- NBC, ABC, MSN, and more -- and online. See the guide that is creating all the buzz for yourself! My uncle is an amazing cook and this is a great appetizer recipe he taught me years ago that everyone in my family loves. It is such a great blend of flavors with the goat cheese, orange, garlic, and fennel. Easy too. 1. Freeze goat cheese for 15-30 minutes to harden before cutting. 2. Using a butter slicer, cut goat cheese into quarter inch thick "coins". 3. Lay coins side by side in a large serving dish. 4. Combine orange juice, orange zest, garlic and pepper in large spouted measuring cup. 5. Slowly whisk in olive oil and then add fennel. 6. Pour mixture over goat cheese. 7. Sprinkle olives around tray. 8. Serve with thinly sliced french baguette. I love love love leftovers. I love being able to eat good food that only took minutes to prep. Last night I made the Chicken Dijon that I love so much and of course I made extra for today. So then I wondered how I could make today's leftovers go from a good meal to a great meal in a few minutes time. 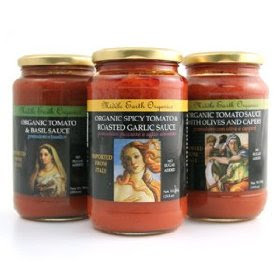 While at the store, I grabbed a jar of Middle Earth Organics Tomato Sauce with Olives and Capers, some fresh noodles and some fresh mozzarella. I warmed up the sauce in a pan while I brought the water to a boil for the noodles. The noodles took 2 minutes to cook, so while I cooked those, I heated the chicken in the microwave. Toss the noodles and the sauce, top with some cut up mozzarella and serve alongside the chicken. Such a delicious lunch (or dinner) in less than 10 minutes. One reason the lunch was so good was the tomato sauce. I don't buy a lot of jarred sauces but this one was fantastic. It tasted like a homemade sauce! I will definitely be buying more to have on hand for when I need a quick meal. 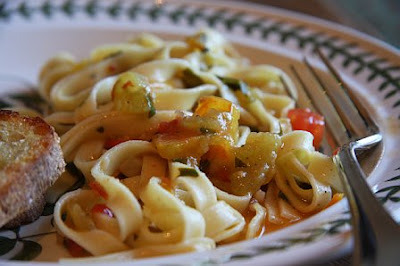 The fresh noodles and fresh mozzarella also jazz up your basic "noodles and sauce". My husband is planning a birthday dinner for me, to celebrate the big 3-5. (Yikes! I'm going to be closer to 40 than 30 but I feel like I'm in my 20s! 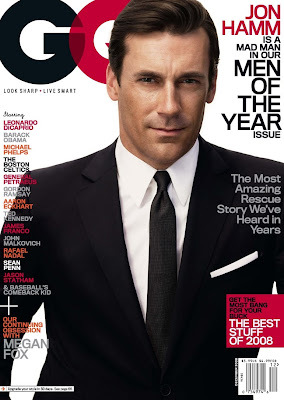 ...with the exception of the crows feet of course.) 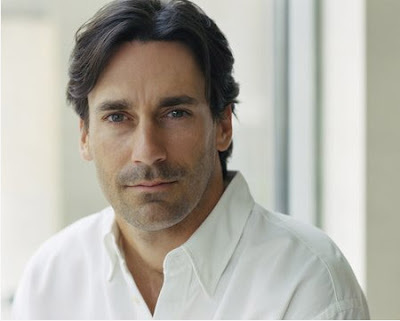 Anyway, he's hosting a family-style dinner at a fantastic restaurant in Seattle called La Medusa. 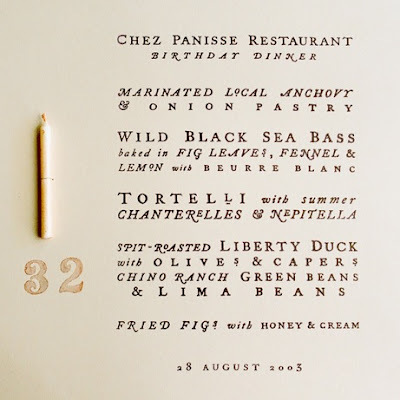 I just came across these menus on Cynthia Warren Design and love them. I might have to make something along these lines for my own party. Check out her site for other beautiful and creative designs. I want one of these Paul Frank "Small Paul" tuxedo onesies for my little stud when he arrives. 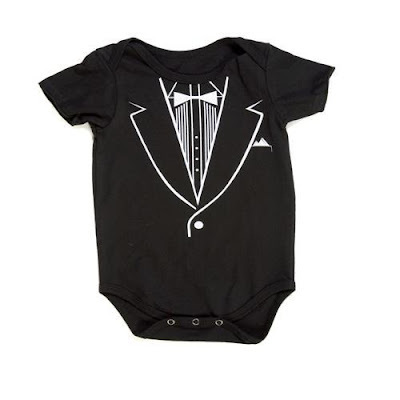 How hilarious to put a little guy in this mini tux when you go out for a nice dinner?! Love it. 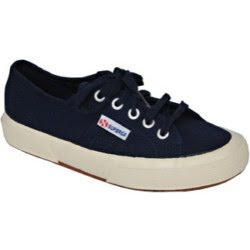 Currently out of stock though. Boo hoo. I'm always looking for great cardigans to wear with t-shirts and jeans as part of my uniform. I liked this dream shawl cardigan from JCrew. It reminds me of one of my most favorite cardigans that I wear regularly. If you're on the hunt, check it out. 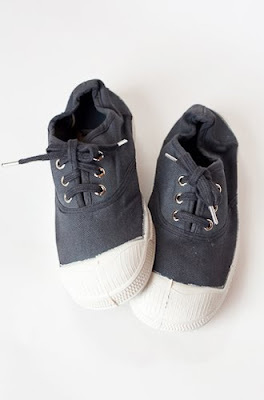 It could be a great piece to throw on when you need a quick outfit that's cute but effortless. 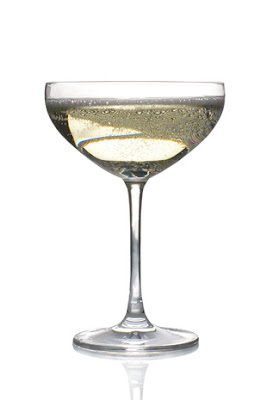 I went to a restaurant in Seattle called The Tin Table that had an entire display of vintage champagne glasses (pictured below). 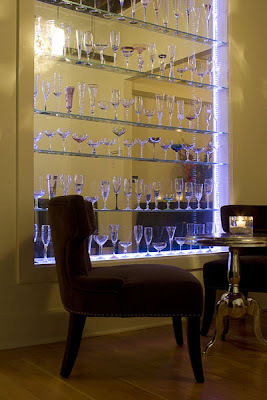 I loved it but then again I have always had an odd obsession with glassware and stemware. I once served an entire baby shower with teeny tiny glasses for white wine. My friends surely thought I was nuts, but I loved it. Between the display at The Tin Table, and watching Mad Men, I have decided that I must have a set of vintage shaped champagne saucers. Thank goodness my birthday is just around the corner so I will be hinting around to friends and family. I found the little beauties featured above from Chow. I'm crazy for them! I'm a creature of habit and therefore I always end up wearing outfits that look the same day after day. My uniform usually consists of t-shirts or tanks under cardigans paired with whatever style jeans I'm loving at the time. 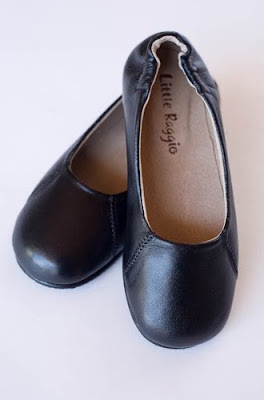 This year I have a feeling there will be another uniform in rotation... lots of long sweaters with leggings and ballet flats or boots. You really can't get a cozier uniform. I've found a few great pairs of leggings to kick off the season but the ones worth sharing are these perfect everyday leggings from JCrew. 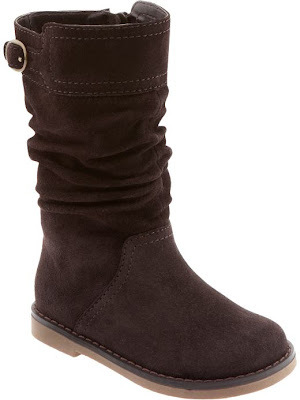 They're the perfect thickness, a great length and the price is right... $29.50! I don't know about you, but fruit flies make me craaaaaazy. A few nights ago at dinner with friends, everyone was talking about their bowls of vinegar or containers with funnels and how happy you feel when you see the pool of death. 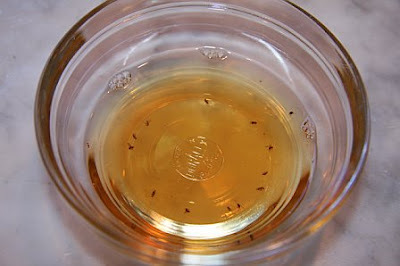 If you're having problems with fruit flies like we all are, just put out a bowl with some apple cider vinegar and a drop or two of dish washing liquid. Makes the whole kitchen smell like vinegar (hate that) but works like a charm! I just got back from the farmers market and I'm happy to say I made it there and back without going into labor. Every time I leave the house now I wonder if today is the day, and pushing around a jogging stroller that's spillng over with food, by myself at the market, is not the ideal way to go. I was happy to make it home. I'm so excited to have another guest blogger. This post is from my friend Amy who I have known for 16 years (I'm tripping out right now, Amy! 16 years?!). Over the years we have always had a lot of similar interests and in the last few years, there's been a focus on topics centered around cooking, entertaining, and healthier living. She and her husband Pat have an amazing garden in their backyard that makes me seep with envy. Oh what I would do for their summer's bounty of herbs and vegetables. They are both great cooks so I can't wait to try this recipe. 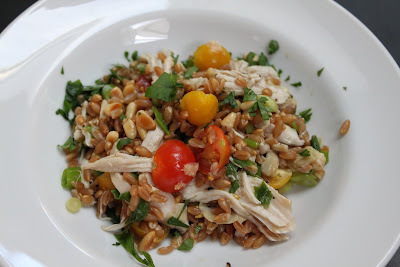 Thanks Amy for the informative and fun post about FARRO and how to cook it! 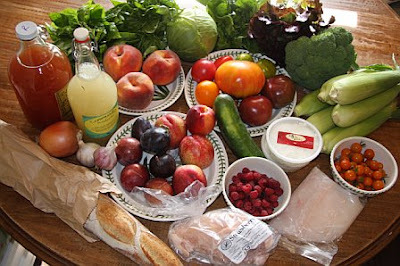 When Colleen asked some of us to consider being guest bloggers for her, I knew that any entry I wrote should follow her themes of eating local, farmers markets, meatless nights, etc. When Colleen then mentioned that she had purchased some farro and wasn't sure what do do with it, I knew I had my topic! Farro is one of my favorite discoveries of the past year and has become a regular in the meal rotation at our house. What is farro? It is the Italian name for emmer wheat. It's a whole grain and looks similar to barley. When properly cooked, it’s chewy and has a nutty flavor. I'm a big fan of Bluebird Grain Farms Organic Whole Grain Emmer Farro. 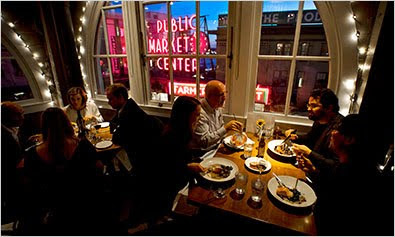 You can find it at the University District Farmers Market, the Ballard Farmers Market, and at Whole Foods. You can also buy it from Bluebird Grains Farm on their website www.bluebirdgrainfarms.com. What do you do with it? Basically, anything! You can serve it as a side dish, put it in soups and salads, or add a protein and voila, your main dish is ready! Cook the farro (boil one cup of farro in 5 cups of broth for 5 minutes, cover, reduce heat and simmer for 50-60 minutes, drain). Toss in a variety or vegetables, nuts, herbs. Add a little vinaigrette or cheese. Last night, we weren't sure what to make for dinner. We had some roasted chicken we needed to use. After looking at what was left in our garden and taking stock of the pantry, we came up with the following combination (shown in the picture above): farro, shredded chicken, a mix of red and yellow tomatoes, artichoke hearts, green onions, toasted pine nuts, and fresh parsley. Tossed with a little vinaigrette, it was delicious! A couple of our other favorite combinations are (a) tomatoes, cucumbers, olives, feta, and walnuts; and (b) fresh corn, tomatoes, green onions, and vinaigrette. With fall just around the corner, I can imagine that caramelized onions and mushrooms will be making appearances in our farro soon. Any recipe you come up with will be great served warm or at room temperature. Leftovers are even better served cold the next day. Enjoy! My sister-in-law ordered these adorable letters from Wee San Francisco spelling out "JOHN" for her son's nursery. She framed each letter and hung them above the crib. 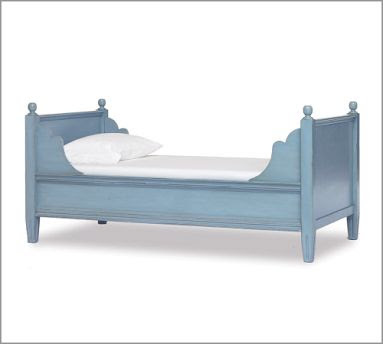 It looks absolutely adorable and is such a fun and playful touch for a little boy's room. I would have never known these little beauties were made by hand-cutting each design out of high quality paper because they are so detailed and precise. What talent! I was also impressed with the size of each piece, since often times I go to order artwork and am shocked at how small the pieces are. In addition to individual letters, Wee San Francisco does names, scenes and portraits. Read all the wonderful reviews on Etsy. I've had the biggest sweet tooth lately with cravings stronger than usual. Of course, I can't get enough of Tara's peach and blueberry crisp and make one every week for dessert after dinner, but what about my morning or mid-afternoon cravings? 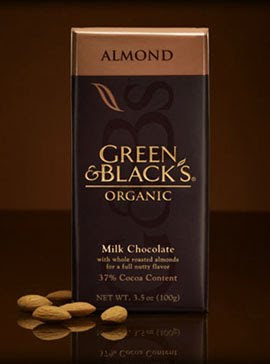 Ah, enter my new favorite chocolate fix... Green & Black's Milk Chocolate with Almonds candy bar. I've been putting these down at record pace... about one per day which is a little unsettling considering each one is 2.5 servings. We've even had to hit the grocery store late night so I can get my fix. If you like chocolate, keep an eye out for these bad boys. They're available in this flavor and many more. My daughter has been to the doctor a few times with me during my pregnancy plus she just had her two-year check-up so she's been talking about the doctor a lot lately. 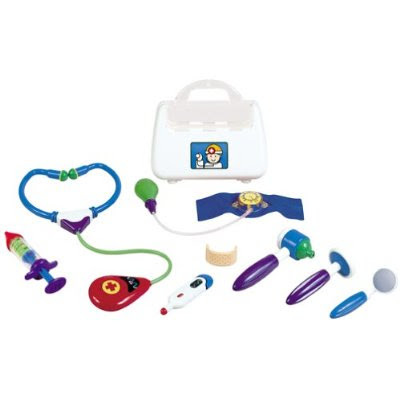 As much as I'm trying to limit the amount of toys we're buying, I couldn't resist this Little Doctor Kit. It's been a huge hit and has already provided countless hours of play with her dolls and with me. She's checked my blood pressure and my ears more times than I can count. She also loves using the stethascope on my belly to "listen to the baby" (it makes noise when you press it against something) and she always gives me a sticker after she gives me a shot in the arm or leg. It's pretty darn cute and one of the better toys I've purchased. 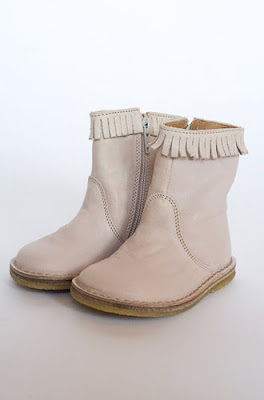 I came across some cute tennis shoes in Cookie Magazine so I looked up the website that was listed and boy was it a big mistake. 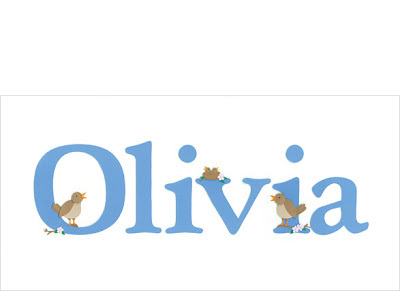 The website Emma & Avery has some of the cutest little girls' stuff I've seen. I could get myself in big trouble here. Thank goodness they have a few fun things on sale right now so maybe.... just.... one.... or two things?????!!!! 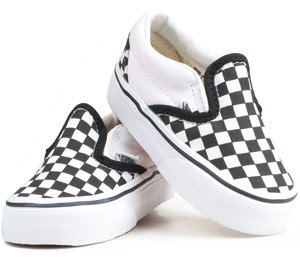 And are they kidding me with all these adorable shoes?! I can hardly resist. 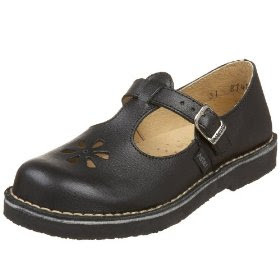 I don't think I can justify one more pair of shoes for my daughter anytime soon, but if I could, these Cape Clogs in solid red or zebra print are pretty darn cute. My mom hosted a little dinner party last night and made one of my favorite side salads that I'd completely forgotten about. 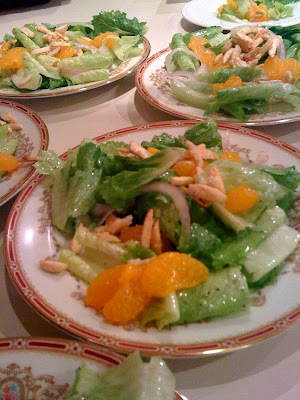 I didn't have my camera so the picture was taken with my phone and clearly not that great, but at least you can see that it's quite a pretty salad with the bright orange mandarins against the green lettuce. Great recipe to have in your file. Place almonds and sugar in a small saucepan on medium heat. Stir until sugar melts and nuts are coated. Make sure to continue stirring so the sugar and nuts don't burn. Cool on a cookie sheet. Break apart if they've clumped together. 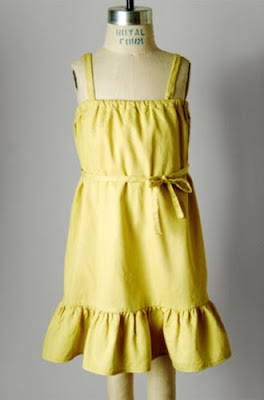 Make dressing. Use about half or so on the salad. The rest will last a few days in the refrigerator. I have been obsessed with de Gournay hand painted wallpaper for years and it was a dream of mine to one day have it in my home. When I moved into my home five years ago, my wish came true with some beautiful panels for my dining room from their Chinoiserie collection. The hand-painted silk is stunning. My dear friend and old boss Maria, the creative director at Anthousa, partnered with the London-based company to create a fragrance and packaging. The packaging is so fabulous that I wouldn't even want to open the box, but you have to because the bottle and the scent are just as amazing. If you're in need of a stunning gift, and something every woman would love to have but may not buy for herself, buy this! The recipient will swoon over it, I promise! 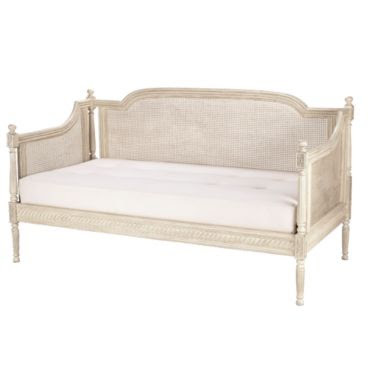 Available at Neiman Marcus, Barneys, numerous online retailers and direct from Anthousa. Refresh with a blend of earthy and citrus scents.This delicately sprawling patter inspired a blend of top notes of Italian mandarin, Sicilian Tangerine and Valencia Orange with subtle hints of mountain fir, petit grain, peppermint and lemon leaves. Finally grounded with dry notes of Cedarwood, woodland moss and white musk, the result is an earthy and graceful spicy citrus blend. Founded in 1986, de Gournay of London resurrected the nearly abandoned craft of hand painted wallpaper by forging a creative alliance with distinguished artists in China. Touched by the elegance of one particular piece of original art, Jardinieres and Citrus Trees, the Anthousa Collection has created this Limited Edition signature fragrance. 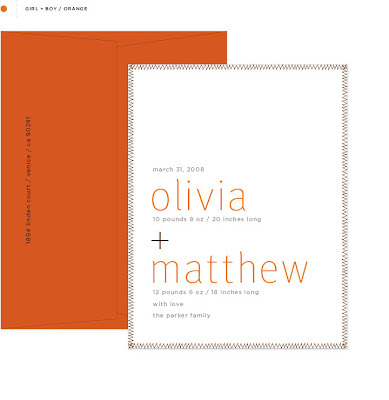 Love these cute and simple baby announcements from Blue Pool Road (via Frolic!). The Swiss water bottle company SIGG recently announced that their water bottle liners were not BPA-free. This comes as unsettling news for those of us who turned to them as a replacement for plastic water bottles. "At first, the company outright denied the use of BPA. In fact, when EWG and the Organic Consumer’s Association placed SIGG on a list of water bottles that were not BPA-free, the company berated them and demanded to be removed from the list. Over time, they stopped claiming to be BPA-free per se, instead saying the bottles didn’t leach BPA." 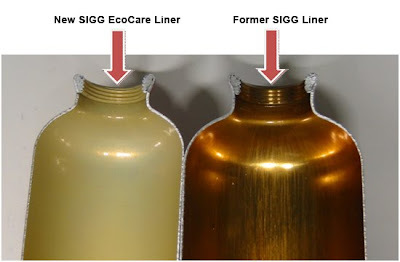 To save face, SIGG is offering an exchange program for those who have the old liner. The exchange program is available through October 31, 2009. 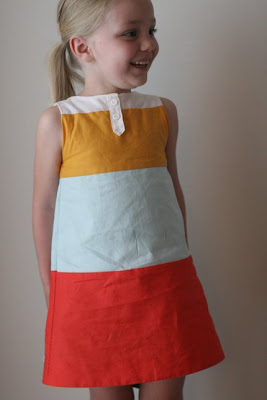 My sister-in-law came across the blog Katie Did with the most amazing homemade children's clothing. 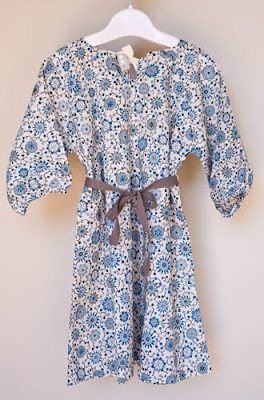 The author/seamstress doesn't currently sell her clothing but she's working on a small line of designs to be available in late summer/early fall. So any day now! I will take one of each please! I found this little tote at JCrew and something about the color and fabric reminded me of some Marni purses I've seen the last few seasons. 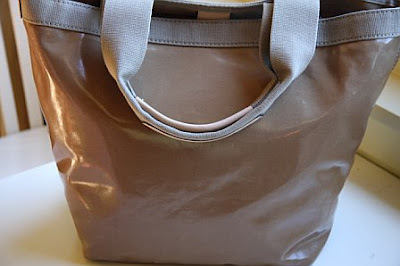 I snatched it up thinking it's a perfect fall tote/diaper bag in a great neutral color. The price was right too... $68.50! Also available in other colors. Store only (online has metallic options but they are not cute). I served the pasta with crostinis using a baguette from Tall Grass Bakery and my new favorite salad (mixing red leaf butter lettuce and romaine). For dessert we gobbled up ice cream bars from Whidbey Island Ice Cream Company. The whole meal was so good that I'm making it all over again tomorrow night. Heat olive oil in a large pan over medium heat. Add garlic and saute for a few minutes. Then add red chili flakes. Stir in tomatoes and saute for a few minutes. Add wine and increase heat to high until it comes to a mild boil. Reduce heat to medium low. Stir in basil, salt and pepper. Continue to cook until ready to serve (5-20 minutes). Cook noodles according to directions in a large pot of boiling salted water. Fresh noodles generally only take a few minutes to cook so make sure to read the cooking instructions. Drain water and toss noodles with sauce. Transfer to plates and sprinkle with feta cheese. * Lynne used parmesan on the pasta which I'm sure would be fantastic. I used feta from the market because it sounded good and I was craving something a little creamier. I've been meaning to blog about these hot air balloons since I first started blogging but without fail I always forget my camera when I go to the store. I mentioned it to the store owner and she was nice enough to photograph them for me (the photo was taken from a staircase looking down at the balloons). 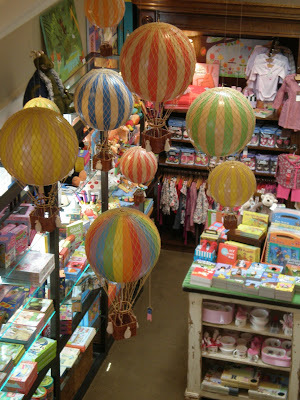 These adorable balloons are sold at Stuhlbergs on Queen Anne (one of my fave stores in Seattle). I know two people who have these hot air balloons in their nursery and both put little stuffed animals in the basket which is so clever and cute. 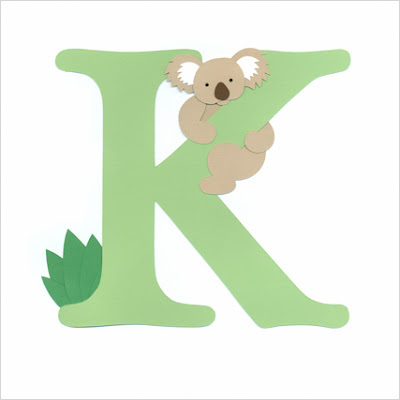 They are such a playful addition to a nursery or child's bedroom. 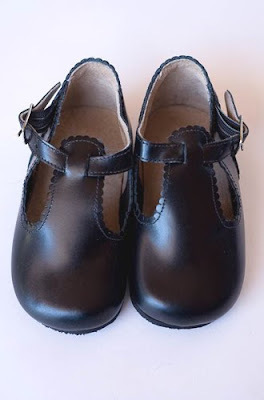 I have a weakness for shoes so it's no wonder that it carries over into my daughter's shoe collection. She spent the summer in Crocs and Salt Water Sandals and while both are cute, I couldn't wait to stock up on some cute pairs for fall. Here's a look at her fall shoe lineup. 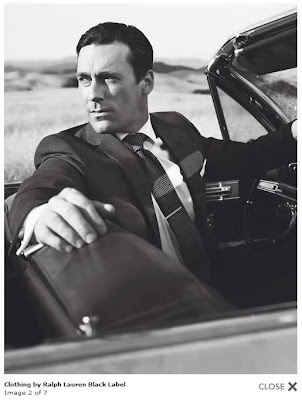 It's a little much, but as I said, it's my weakness.